I consider myself very fortunate to be able to collaborate with some of the most wonderful people in the world – not just researchers who I work with regularly but also the librarians who I work with everyday. My most recent collaboration has been with our cataloguers, Christina Egan and Dianne Stacey. 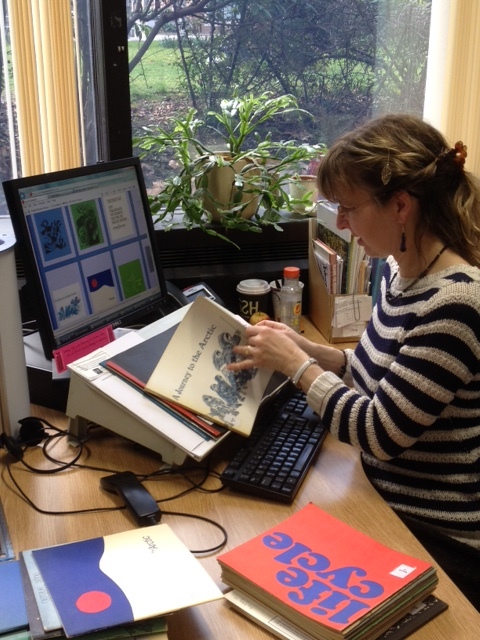 Christina and Dianne have just finished cataloguing one of the most interesting of our Special Collections, Jerome Bruner’s MACOS or Man: A Course of Study Curriculum Project. The materials were donated to the library by Mr. Barry D.Varley-Tipton (see: https://newsamnews.ioe.ac.uk/2013/07/24/curriculum-project-macos-man-a-course-of-study/) in July 2013. Man: A Course of Study (commonly referred to by the acronym MACOS or M.A.C.O.S) is the brainchild of the American psychotherapist and Harvard academic Jerome Bruner. Bruner believed that it was possible to teach children to be more humane and eliminate racism and ethnocentrism by studying another culture closely. He also believed that you can teach children complicated ideas using the ‘spiral curriculum’ method which introduces the same theme in increasing complexity over a period of time. The successes of this collaborative Special Collections project have been partly due to the interest we all shared in the material but also because of the regular discussions Christina (who was tasked with managing the project) and I had over the course of several weeks. I am particularly indebted to Christina for masterminding the inclusion of additional terms which enhance the catalogued records and which will make it easier for the user to find additional relevant content. Not only did Christina and Dianne ensure that the catalogue records contain all the necessary bibliographic and descriptive information as is custom and practice – but they also included information about content that we have which the MACOS site lacks and vice versa. We hope this additional information will be useful to other researchers and librarians. MACOS is an example of one of the many curriculum projects that were devised in what has been referred to as the ‘Golden Age of the Curriculum’ in the US and in England. Now that the collections is fully catalogued, I hope you will be able to explore these materials which demonstrate so clearly Bruner’s pedagogic theories. The accompanying LibGuide at http://libguides.ioe.ac.uk/macos has been updated to provide links to the catalogue records. Christina Egan who was in charge of this project will write about how she decided on what information to include in the catalogue records to ensure users are able to find this wonderful resource in the next post. This entry was posted in Library, Special Collections and tagged Curriculum Project, interdiciplinary curriculum, Jerome S. Bruner, MACOS, Man: A Course of Study, social anthropology, special collections, Spiral Curriculum. Bookmark the permalink. Pingback: Happy 100th Birthday to Jerome Bruner!